Over the last year or two I’ve taken time off building and flying quadcopters. Life and other things has been taking up my brain, so some hobbies took a back seat. 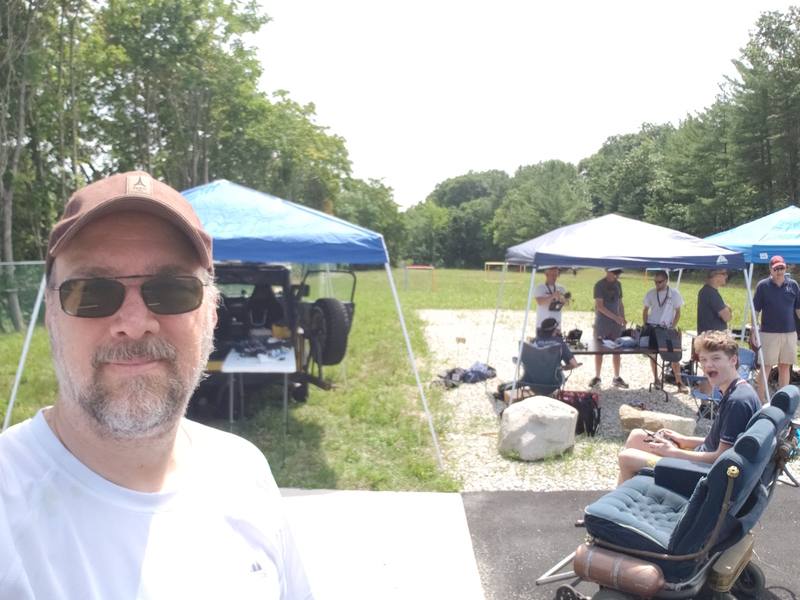 Up at the lab, an event was coming up that would bring in some other pilots from New Hampshire and do a race day. I decided it was time to build a new quad, and get some race time in. The last big event I went to was NAFPV 2017. It was great fun, and I ended up winning a 220mm carbon fiber frame. With that in hand, I began building up a new quad. Wolfwhoop TX1912 5.8 video transmitter – I chose this board for the MMCX small antenna connection, and the ability to select bands and channels easily via a button and an LED display on the top. Super handy. CrazyPony 4in1 ESC This is probably the biggest change for me. Originally I built quads using separate discrete ESC’s. This board puts all 4 ESC’s on a single board. It definitely makes the wiring cleaner, but a little denser on the stack. Betaflight F4 flight controller Betaflight is certainly the star as far as flight controllers and software goes right now. Their configuration tool is excellent, and the board is very good. I was slightly concerened about working with a board that had no header pins, but decided to roll up my sleeves and get experience in very tight soldering setups. FS-X6B Flysky receiver – Yeah, I’m still rocking the FlySky setup. It’s still working well for me. I like this receiver because it can mount on the component stack (even though it’s a half-board). The build went off without too much trouble. I found all the missing tiny bits I needed, did lots of very small soldering, and over the space of 3 weeks, got everything assembled and tested. It worked! All the components were talking to each other properly, and I even have a fully function OSD (on screen display) showing stats from the batteries, flight controller, and receiver. Even got the LED strip showing the arming state and a set of ‘tail lights’. Hurray! I did a very quick flight test to check stability, then went up to the lab to put the final touches on things. This is where I made my first mistake. I decided to take Quadzilla outside for a quick LOS test fly. 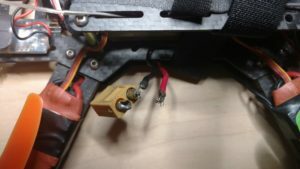 My FPV gear wasn’t ready for flight testing, but I wanted to see the LED’s and play around. I put the quad on the ground, armed it (which spin the props slowly), stepped back, and gave it a little throttle. The quad lifted, started to move backwards, and basically… fell into my hands… still throttled and running. Those props HURT. I scraped up my hands a bit before I was able to disarm. So what did I do wrong? Pretty easy actually. I flew Line of Sight at night. LOS requires visibility on the yaw, pitch, and roll of your craft. I coudln’t see it, it was too dark. The rear LEDs were pointing at me, which made it even harder to see. I was in Air mode, not Angle mode, which means there was no flight stabilization. Quad did what I told it to, which in this case was to fly right at me. Embarrassing, slightly painful, but no major harm done. Bleeding stopped within 10 minutes. Chagrined, I took the quad home, cleaned up, and started prepping for the race, which would be in 3 days. The quad was pretty much ready to fly, I needed to set the mode selector properly, and tweak the LEDs. I also decided to move the battery from underneath the frame to on top of the top deck. Plenty of room there, and the quad would sit on the ground when taking off or landing, not on the battery. Win! Turns out my batteries needed some love. The 1300mah 90C batteries i got last summer had been sitting idle for a year. Of the 8 batteries I had, one melted while charging, another was puffy so I decided not to use it. That left 6, which charged okay, but my parallel charger has seen better days. A new gang charging situation is needed, more on this in another post. I charged all my other gear, including a nifty little all in one 9″ monitor with build in 5.8 receiver I carry with me. Great for checking video and watching other pilots fly. I packed up everything into the Jeep and on Sunday, headed up to the lab for race day. The folks from the 603 Southern New Hampshire Drone Pilots group showed up, bringing our total pilots to about 10. We ran a couple heats with 4-5 craft in the air at once, on a short ‘H’ shaped course that had several gates and a ‘turnaround’ cube in the middle. The course was off the end of the back parking lot, so there was plenty of room to drive up, park, set up your tables, and get flying without fear of getting hit or getting in anyone’s way. I flew 3 batteries. First flight was a very basic FPV test (as really this was my first FPV time on the new quad this year, and things went fine. Video was strong and clear, and the quad was very responsive. I flew completely in Angle mode, which is a VERY simple flight mode. I wasn’t comfortable enough yet to go into anything that would let me go more crazy. This was a first time out, I didn’t want to shatter anything. Second battery apparently was in bad shape. No strong thrust, just running limp. I figured out later the 4S pack had a dead cell, and was functioning as a 3S. That explains that. Last battery was in good shape, and I was feeling the power of that 4S setup. Unfrotunately, because I was in angle mode, I couldn’t pitch forward enough to get decent speed out of it (I’d just climb), so I was taking it pretty easy. I flew a gate or two, then went through the last one on the course – I caught a motor on that, which spun me out into the trees. 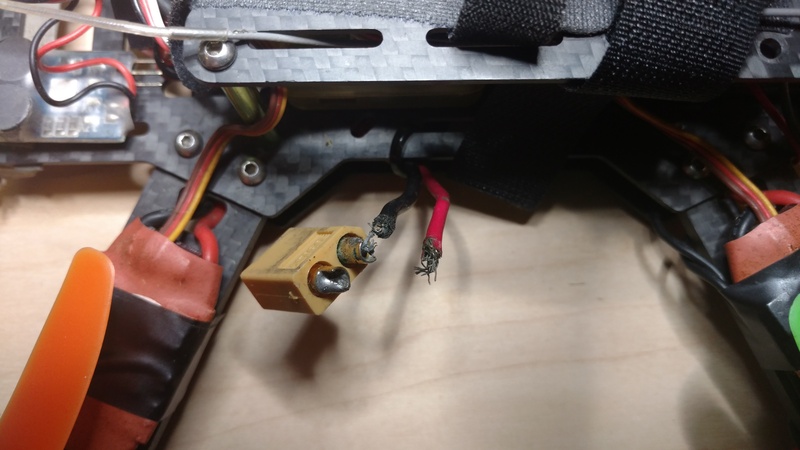 The damage to Quadzilla is pretty minor, but I did rip out my VTX antenna, so that ended me for the day. I’m not complaining, I flew, I had a great time with the other pilots, and you’ll be damned sure to see me flying again soon. A quicky post here. I took about a year and a half off drone racing, and I’m just getting back into it for a bit. What has happened during that time is that the community has moved onto to faster, smaller drones. At the moment all I have is my 250mm QAV250 clone, so keeping that flying until I build a new machine is what’s keeping me busy. 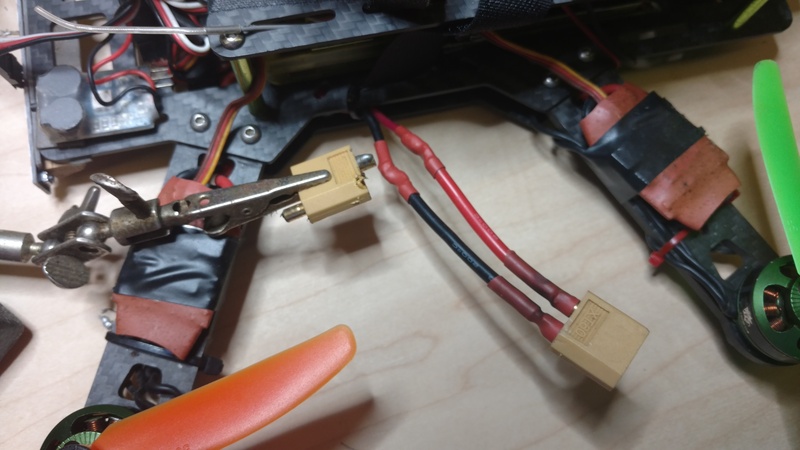 I went out to fly yesterday with some folks in Waltham, but before I could power up, I noticed my XT60 connector had broken loose on the positive lead. Bad news. That’s not something I can fix in the field. No flying for me!. Tonight I sat down to repair the power connector, but realized I didn’t have any spares. I tried to reuse an old connector, and… well, melted it into goo. 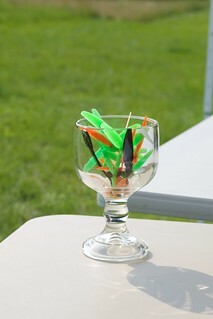 (that’s what’s int he alligator clips in the picture below). I had one other one, and managed to desolder and solder in the new connection without too much damage. I am sort of proud of the fact that I was able to reconnect the power leads, and add 3″ of extra silicone insulated feed wire, and get my shrink tubing in place without much chaos. All fixed and insulated properly. Tomorrow I should be able to fly with the MultiGP folks up in Derry, but I know my time with the 250 is coming to an end. I have a new frame and motor and battery setup in mind, but more on that when things get closer. For now, things are packed up and ready to go flying tomorrow! There’s a nice article on the AOPA site that has some choice interview bits with me and a nice video about the NAFPV2015 event. AOPA.ORG : Racing like Superman (Note, I didn’t pick the title). Second article on Drone Racing. The Globe was out again for last Saturday’s race, and did another article on us, complete with video. You hear it before you see it: a high-pitched whirring that sounds like a dive bomber crossed with the world’s largest bumblebee. This past Saturday, the buzz came from the edge of a large field in Berlin, just miles from where Interstate 495 meets Interstate 290 outside of Worcester. Moments­ later, there was a loud thwack, followed a sympathetic “ooh!” from a dozen spectators. Really Awesome drone racing day. We’re definitely doing it again. I did come away with some changes / updates / stuff I want to do different next time. I need more batteries. 2 1800’s and a 1300 are not enough to get a good day of racing. Some of the other pilots were carrying at least 10 batteries. My Mobius camera is on the fritz. I’ve tried reloading firmware, reflashing, reformatting the card… I’ll try a few more times, then I may order a replacement. I tried a higher resolution set of goggles. The picture was definitely an improvement, but I’m not sure it’s $500 worth of improvement. Better to get a new groundstation antenna to get clear video. Looking forward to the next event!